It's a treat to post Auntie Donna's first blog. Thank you for visiting and being a fan. Today is: Every dog gets their day when they have the chance to walk and play. 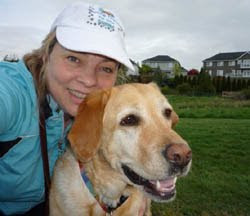 When you share a walk with your furry friend you can enjoy great health benefits too. Dogs need the outlet to focus while walking at your side and listening to you. When you start out, take the time to review a few of the basics, to sit, heel, and pay attention when you make a request. You will know when your furkid is on board with you, when they keep looking your way and checking up on you. If this doesn't happen at first, stop on occasion to practice the basics again, be patient & soon you will be on your way. A trainer can review these ideas with you to allow for a rewarding way to walk each day. Today, I walked with Mr. Bentley, an imperial Shitzu part Maltese, and Miss Wilma, who is a sweet Jack Russell Terrier, on a two hour walk. Now some might say this is a long way to go for those little legs on Mr. Bentley . We walked and stopped on occasion for some photo opportunities, you will see once they post, each "furclient" was happy to walk. They keep a great pace and get some water when we stop. Keep in mind no matter the size of your friendly pooch, they need a good daily walk. They will relax once they are home and maybe you will too. Your furkid will be most grateful, and next time will be excited to go with you. Keep a good healthy walk in your schedule for both of you. If you find during your long days this is a challenge for you, then call on Auntie Donna to be your pet's nanny for your pets.